Poké Floats is an unlockable stage in Super Smash Bros. Melee. The stage takes place in the skies of Kanto, the location of many giant floating Pokémon balloons (from which the stage takes its name). 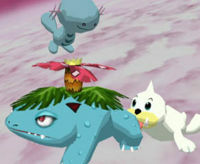 To survive on this stage, the player must jump from one Pokémon balloon to the next. The order of the balloons are as follows: Squirtle, Onix, Psyduck, Chikorita, Weezing, Slowpoke, three Porygons, Wooper, Sudowoodo, Snorlax, Venusaur, Seel, Wobbuffet, seventeen Unowns, Goldeen, Lickitung, Chansey, and Geodude. The balloons then repeat themselves starting with Squirtle. To unlock the stage, the player has to fight 200 matches in VS mode. Onix, Psyduck, Slowpoke, Porygon, Wooper, Seel, Lickitung, and Geodude, despite appearing here, do not have trophies, nor do they appear in Poké Balls. Onix was, however, a Poké Ball Pokémon in the first game. The Sudowoodo trophy is unlocked along with this stage. This page was last edited on February 23, 2019, at 01:44.